We are being called to a higher realm of influence. The Church today is uniquely positioned to influence the culture around her. But Christians are walking away from this opportunity, this responsibility, in favor of building a separate, "safer" culture of our own. Yet we've been given the tools to break personal strongholds and change the course of nations. 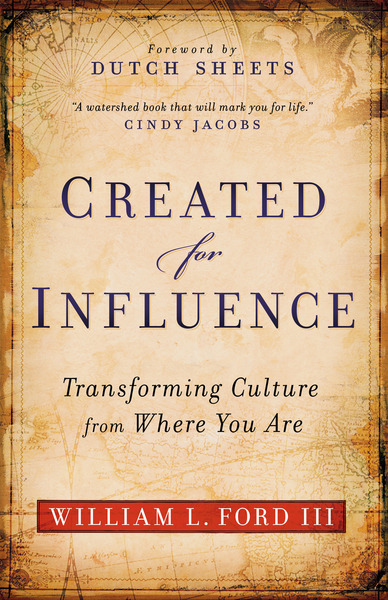 Now revised and expanded, Created for Influence shows how you can do this--and transform culture right where you are. Sustained Kingdom prayer can release influence everywhere, from your own home to governments and judicial systems. It can undo demonic assignments and break the bonds that hold lives and nations captive. This revolutionary book is calling you from a spot on the sidelines to a position on the front lines. It's for believers who are ready to join the fight and grip the heart of God in prayer. Are you ready to transform history?